Wood elves range in their societies conformations from tribal hunters to sophisticated forest dwellers. A very small village like the one portrayed in this map has a tribal structure. The eldest among the elves is considered superior and takes place as the tribe’s shaman and leader. 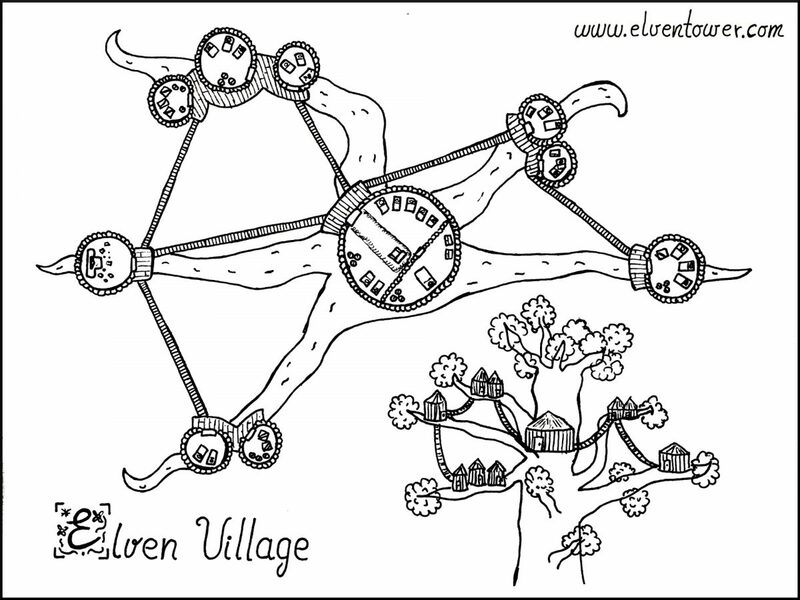 The village is located in the branches of a great tree. The elves are very territorial and will risk their lives to protect their forest region and home tree. The biggest hut, constructed from the tree trunk, houses the elder shaman and his immediate family. The mightiest warriors or hunters are often invited to spend the night here, it’s a great honor, and most male adults are in fierce competition to impress the shaman. One of the huts, apart from the rest, has an altar to an ancient elven god. Tribe members come to place offerings from every hunt. The effigy is made of wood. The elves don’t know it but their god is actually Corellon Larethian, only they revere him under a different name and face.